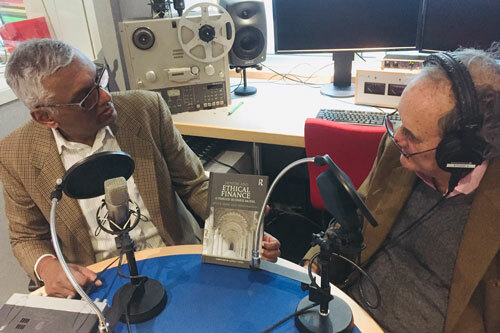 Professor Atul Shah, Visiting Lecturer in the Department of International Politics at City, University of London has appeared on BBC Radio 4 to discuss the intersection between faith and finance. He was interviewed by presenter Mark Tully for Something Understood, an ethical and religious discussion programme that examines some of the larger questions of life. Professor Shah is author of the book Jainism and Ethical Finance which looks at the world of finance, governance and accountability from the spiritual perspective of the ancient Indian religion, Jainism. The episode examined the sometimes uneasy relationship between the management of money and religious beliefs. Specifically, it explored the differences between the Jain ethical system of business practice and the prevailing Western financial theory. Jainism explains that when you possess, you become possessed. Lasting freedom comes from understanding the limits of money & wealth and detaching one’s life from possessiveness. For the Jains, because of the strong basis of self-discipline we do operate in business, but we also understand the limits of business and not to get greedy and to become too powerful and obsessive about growth and profits. I would say that the three keys from the Jain philosophy for business are peace, patience and perseverance. Professor Shah also recently launched his new book Reinventing Accounting and Finance Education by giving a keynote address at the Annual Education Conference of the Institute of Chartered Accountants in England & Wales. Professor Shah says that serious and radical reforms are required in the teaching and research of finance. “The theories that have been taught in business schools over the last forty years assume that greed is good for the whole of society and materialism is the key to lasting happiness and fulfilment. “Economics is the grand-father, finance the father, and accounting the servant of such ideological bias and ruination. Thousands of teachers and academics teach these models and theories as if they were scientific, objective and free from any cultural bias". “My latest book follows research on Ethical Finance and The Politics of Risk, Audit and Regulation, to overhaul the methods and content of accounting and finance education, and align them towards a more inclusive, caring and sustainable future. “It provides readers with practical examples and stories about how some of the ideas can be applied in the teaching, and opens engaging new possibilities for academics to bring research into the classroom”. "You are the global leaders of tomorrow"